KitchenAid 23 cu.ft. counter-depth side-by-side refrigerator. 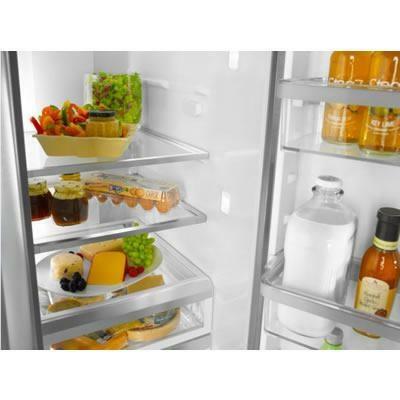 Maximize the freshness of produce with the Preserva™ Food Care System. The system combines sequential dual evaporators to maintain optimum humidity and temperatures, an air filter to reduce odors, and an ethylene-absorption cartridge to help keep produce deliciously crisp. Refrigerator 13.00 cu. ft. / 0.37 cu. 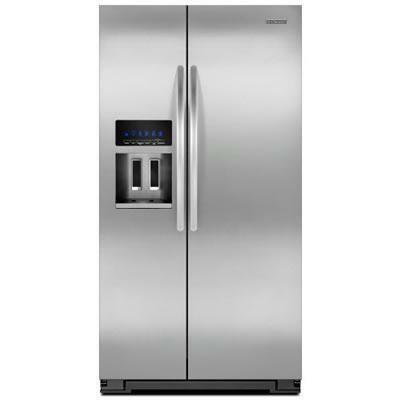 m.
Freezer 9.50 cu. ft. / 0.27 cu. m.
Technologies The Preserva™ Food Care System uses a trio of features to maximize freshness, particularly for fresh produce; FreshFlow™ Air Filter monitors the air inside the refrigerator helping to minimize odor transfer; FreshFlow™ Produce Preserver absorbs ethylene gasses to delay over-ripening of fresh produce; ClearVue™ LED theater lighting makes it easy to find items inside the refrigerator and freezer, even the crisper; Luminesse™ Interior Design features aluminum and stainless steel on shelves, crispers, and freezer baskets. Additional Information Sequential dual evaporators ensure independent temperature and humidity control to optimize flavor and texture; Adjustable door bins with removable insert keep condiments and other items organized for food prep and serving. Dispenser Features Chilled water, crushed ice and cubes. 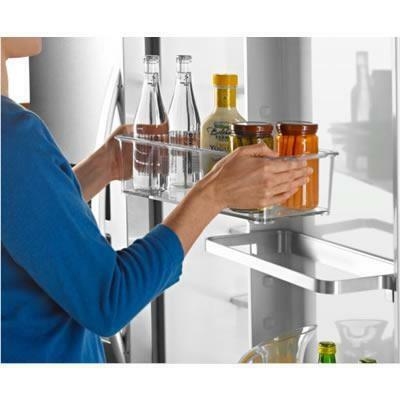 Additional Dimensions Depth with handles: 30". Warranty 1 Year. Second through fifth year limited warranty on cavity liner and sealed refrigeration system; Sixth through tenth year limited warranty on sealed refrigeration system.